If you’d like to submit something to us, please do so on this page! But before, let us explain what contributions we’re looking for, and give some recommendations. If you’ve read our about us page, you may be thinking all contributions must conform to some scary dogma (Marxism, to name the beast), and that a failure to use at least ten words right out of our religion’s Holy Texts will result in immediate rejection. But worry not! Although Vox Artes does pursue an overtly Marxist mission, we still believe it would be foolish to reject all other approaches. Simply put, we believe any angle can enrich this larger mission. Now of course, if you can contribute your Marxism, we’d be glad; but anyone who wants to shine their marginalized light on a work, and even those of you who just want to indulge in poetics or the fanciest hermeneutics–we welcome contributions from all of you! (The first do get an advantage, admittedly). 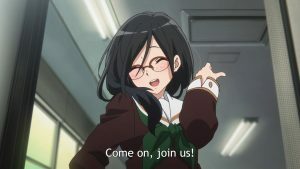 As a note, although our main topic is anime, we accept contributions on anything from manga to light novel to visual novel..
Rather than a complete post, we ask you to pitch ideas. Now of course if you’ve already got something complete, you can always submit that in place of sample writing; but there’s a reason why we’d rather start before you write: to make selection easier. It may sound harsh, but in case your idea doesn’t satisfy us, we’d rather make it clear right away so you can try and pitch it somewhere else than make you suffer the disappointment of writing something only to be rejected. There’s a second reason, however: it’s that you don’t need to be a native English speaker. If your idea is interesting but you struggle to put it into good English, we’ll be able to help you so that publication goes smoothly. As a note on sample writing, if you don’t have one that’s perfectly fine; we’re glad to publish new writers who want to submit their work to an audience for the first time! Our main goal is always to bring more perspective under the spotlight. After you submit, we’ll get back to you within a week. If our answer is positive, we’ll ask you to submit an outline with a general overview of your contribution’s structure as well as its main points. We’ll discuss that, adjust it with you if needed, and then we’ll let you move to writing. As a general rule, we value freedom; if you want regular feedback, then please do mail whenever you wish! (You will know who to mail after your initial pitch gets a response) But if you’d rather be alone with your post you’re ready to submit your final draft, then that’s great too. As for our editing, it is done so that your meaning is preserved, and in that perspective we may ask for clarifications. Once editing of the final draft is complete, we’ll send the you the pre-publication version of your post, and you can tell us if there’s any change you’re unsatisfied with. Please do note that we reserve the right to cancel publication at any point, unlikely as it is. As proper commies, we’re not overly harsh about reproduction. However, as you may expect, plagiarism will not be accepted; and submitting a post you’ve already uploaded elsewhere will count as such. In case an issue arises between the site and you, and you want your work here taken down to be posted elsewhere, we will do so (though a good reason will be needed, such as a fundamental conflict in ideals, for instance). As for posts which are here, you can link to them and quote extracts to promote it to your personal audience, but please do not reproduce it entirely anywhere else, knowing this website is already entirely free and ad-free. For now, lots of love. Later, money, hopefully (even if you’ve published before we can pay you). The reason is that developing and maintaining the website has been and is exceedingly expensive, and we cannot afford further cost at the moment. However, once we make enough money (through Patreon most likely), we will most definitely pay you for your contributions.